This slightly sweet, coconut-y chickpea and pumpkin curry is gonna keep you warm and happy all winter long. Or until you’ve eaten all of it. Winter is coming (<- hello, panic attack). In fact it’s already here. And aside from being a holiday season – a season when we’re supposed to do nothing and be really happy every single day, it’s also the time when it’s freezing cold and I’m hungry all the time. It’s the time when it doesn’t quite get bright outside and the thought of fresh vegetables, smoothies and salads makes me freeze on the inside and shiver on the outside. All I want to do is wrap myself in a blanket and disappear for the next few months. But unlike a bear in winter sleep, I will be drinking something hot, creamy and comforting. Or eating something that’s gonna warm up my body and tell me it’s fine – I will somehow survive this tough winter. That’s why I’ve been making a lot of soups, stews and curries lately. Like this sweet and comforting chickpea and pumpkin curry. I’m pretty sure I did something illegal here, because I used garam masala with red curry paste, lime leaves and coconut milk. 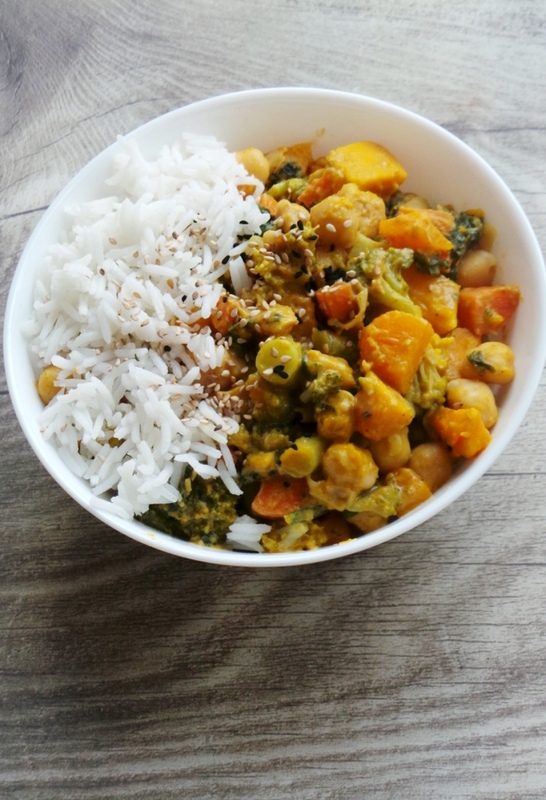 Which means this chickpea and pumpkin curry a mixture between Thai and Indian food. Someone stop me, because I’m breaking some serious rules. Now. I must warn you. All I know about curries is they taste good. So good that sometimes I would prefer them to pizza (<-can’t believe I said that). The other thing I know is that the difference between Thai and Indian Curries is in the freshness of their ingredients. Thai curries use fresh ingredients while Indian curries use dried. Right. I learned this from a book I bought a while back named 50 curries. I must say – I haven’t made any recipe from there yet, but I like the ideas and I read the intro. That pretty much summarizes how I read any cook book. And how I usually follow recipes – I see something, or taste it and then I get an idea, how I want to make it. For this curry I wanted something full of flavor, sweet, fresh and super easy and quick. Here’s what’s important if you want to make it. Have everything you’ll need ready before you start. Chop all vegetables, drain and rinse the chickpeas, even open the can of coconut milk. Curries are made very quickly – you need all ingredients ready – no time for chopping or opening while cooking. That way vegetables stay fresh and crunchy and don’t overcook (something I love about Thai curries). I didn’t add any garlic or onions to this curry, but if you want something more flavorful, add these detoxifying stinky angels before you add anything else. Sauté them with some olive oil first and then add the spices and red curry paste. Combine everything and then add coconut milk. It might even make the curry better. For this chickpea and pumpkin curry I bought the garam masala and red curry paste, I did not make them myself. Otherwise it would’ve taken me a long time to find the ingredients and to make my own curry paste and garam masala. I’m not saying I wouldn’t do it in the future one day when I need to make some new experiences in the kitchen, but right now I prefered to go with convenience. Also I made this curry very vegetable heavy, because right not this is my only source of vegetables. I’m not eating any salads, because I feel like I would freeze like Elsa. One (almost warm) smoothie in the morning and that’s it. If you’d like to make this chickpea and pumpkin curry more sauce than veggies, just use half the vegetables / chickpeas or leave out the things you might not like. If you’re anything like me, you’ll eat a curry one day and the next day you’ll want something else. Not because you didn’t like the curry. Just because your capacity to eat the same thing every single day is sometimes quickly depleted. So if you don’t want curry the next day, BAM leftover makeover to the rescue. 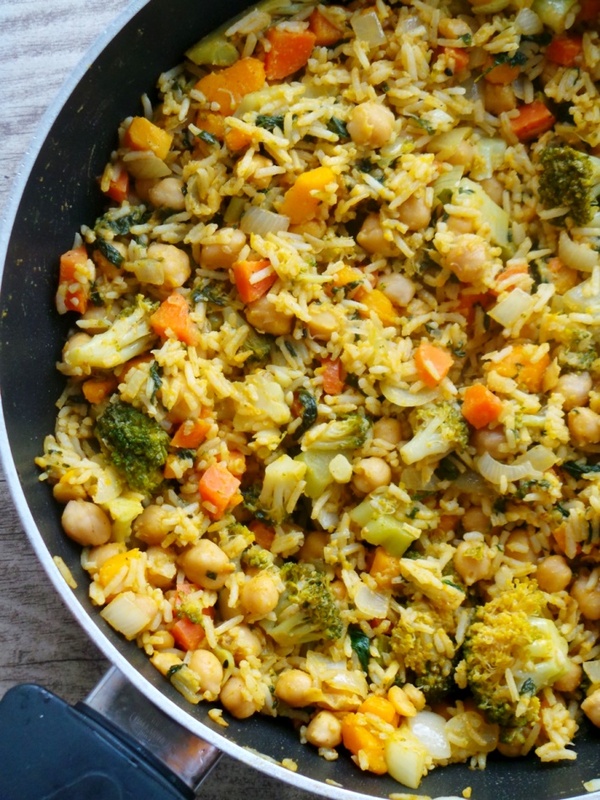 Stir fry that curry with the rice and some onions and garlic and there you go – vegan stir fried rice. 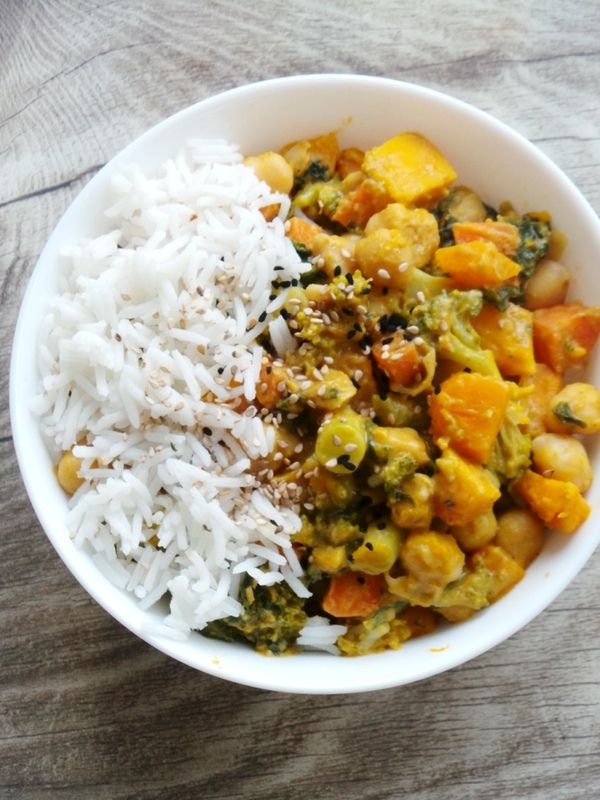 This vegan coconut chickpea and pumpkin curry is the perfect meal to keep you from getting a flu this winter. It’s gonna warm you up from the inside. This way your body can focus on keeping bacteria and viruses away, not on shivering to maintain your body temperature. It also contains a lot of spices like ginger & turmeric and vegetables that could prevent infections. 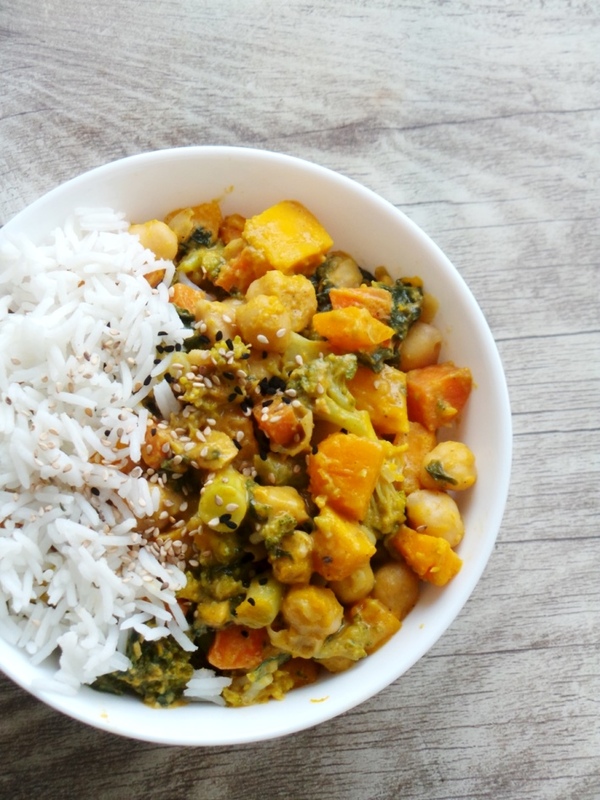 This vegan and gluten-free chickpea and pumpkin curry will warm you up and give you a delicious antioxidant boost. Wash, peel, seed (if applicable) and chop all vegetables - pumpkin, broccoli, carrot. In a large skillet (I used non-stick) at medium mix garam masala, turmeric and curry paste with some olive oil for 1 minute. If you choose the option of adding onions and garlic - sautee garlic and onion for 1 minute before you add the spices. Then add the spices and the curry paste. Stir in coconut milk, until everything is combined well together. Let cook a little, to thicken (about 1 min). Add the chickpeas and the pumpkin. Cover with the lid and cook for about 5 minutes. Uncover, add the lime leaves and spinach. Let cook like this for 2-3 minutes (until spinach is unfrozen). Then stir in the broccoli and carrot, cover and let cook for 2 min. Turn off heat. Serve with basmatti rice and some sesame and nigella seeds. This curry is very vegetable heavy. 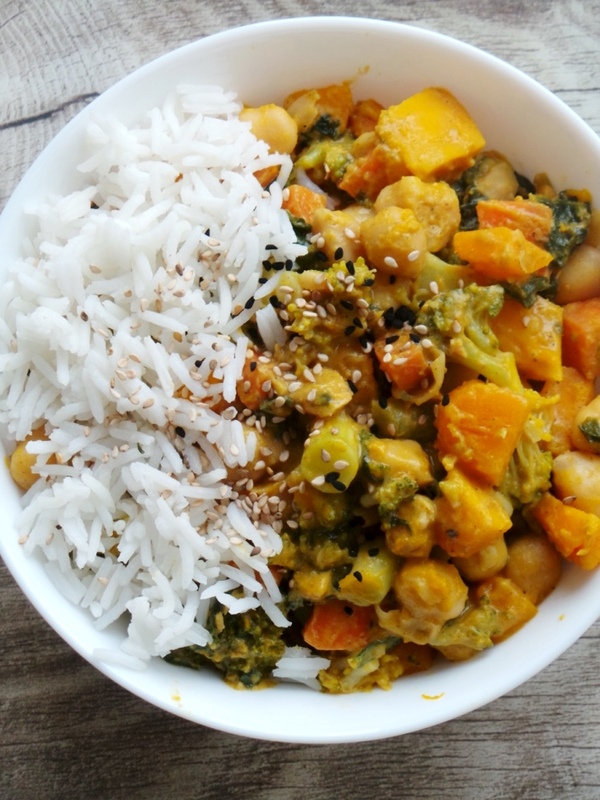 If you'd like to make this chickpea and pumpkin curry more sauce than veggies, just use half the vegetables / chickpeas or leave out any vegetable you might not like. Hope you like this recipe – it’s really easy, delicious and warming.